Best Damn Dish: Steak Ajvar at Please Chef Ryan Santos creates a magical and beautiful mashup: Eastern European ajvar carries smoky Mexican flavors over a perfectly cooked steak, crispy fried shallots, eggplant, tomato, and a red pepper bordelaise. If you want to try something you have absolutely never been served before, or even heard of, Please is the place to go. Each iteration of the tasting menu, which changes several times a year, introduces new marvels and curiosities. Dining at Please is a kind of whirling carousel of discovery. Sometimes it can make you dizzy, but the results, increasingly, are as delicious as they are unusual. 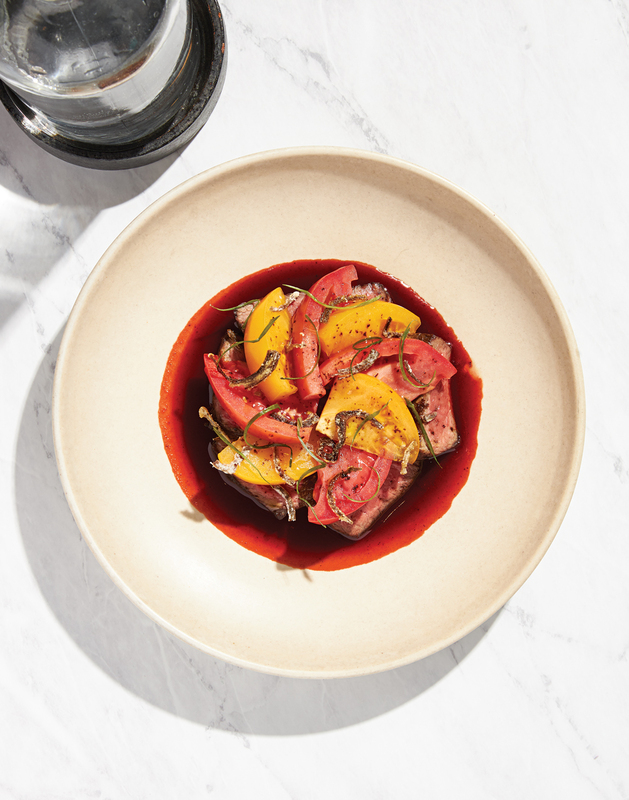 Without ceasing experimentation, Chef Ryan Santos has anchored more and more of his ideas to truly satisfying flavors, like in the steak ajvar, with an Eastern European spread made from roasted red peppers and sometimes eggplant. Santos took the idea, spun it across the globe, melded it with Mexican-inspired flavors, and served the resulting spicy puree on top of perfectly cooked pieces of steak in a faintly smoky broth. The dish is global in its in influences while still being fresh and local (it is available only in its appropriate late-summer season). It’s complex and innovative while still being bottom-of-the-bowl-wiping-ly tasty. Please manages these magical acts of fusion and transformation like no other local restaurant. Certain dishes, like cedar-rosemary custard with quince preserves, appear in different incarnations throughout the year; others, like aebleskivers (tiny fried apple dumplings with a shower of gjetost, sweet-and-salty Norwegian goat cheese) are now fixtures. Please keeps refining and improvising, whether based on mood or season, but it has become a great restaurant by taming some of its restlessness and holding onto what works. Although a certain amount of restlessness, of course, will always be part of what makes Please special.